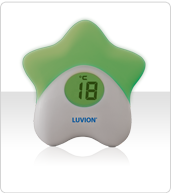 The Luvion® Glowstar is a smart thermometer and a gentle nightlight in one. It changes colour to let you know at a glance whether the temperature of a room is too low, a little warm, too high or just right. It helps you to maintain a safe and comfortable sleeping environment for your baby.